For Bryony Cottage - from the south on A591 follow the one-way system into the town centre. At the top of Compston Road turn left (signposted Grasmere) and continue for 300 mtrs to mini roundabout Turn right here and continue up Smithy Brow (past the Golden Rule on your right). The road bears left just past the pub, do not follow the accute left bend but proceed almost straight ahead up a short steep incline turning right at the top. Bryony Cottage is immediately on your left where the road widens into a parking area. For Bryony Cottage - from the north on A591 follow Rydal Road to the edge of Ambleside where you will encounter a mini roundabout. Turn left here and continue up Smithy Brown (past the Golden Rule on your right). The road bears left just past the pub, do not follow the accute left bend but proceed almost straight ahead up a short steep incline turning right at the top. Bryony Cottage is immediately on your left where the road widens into a parking area. 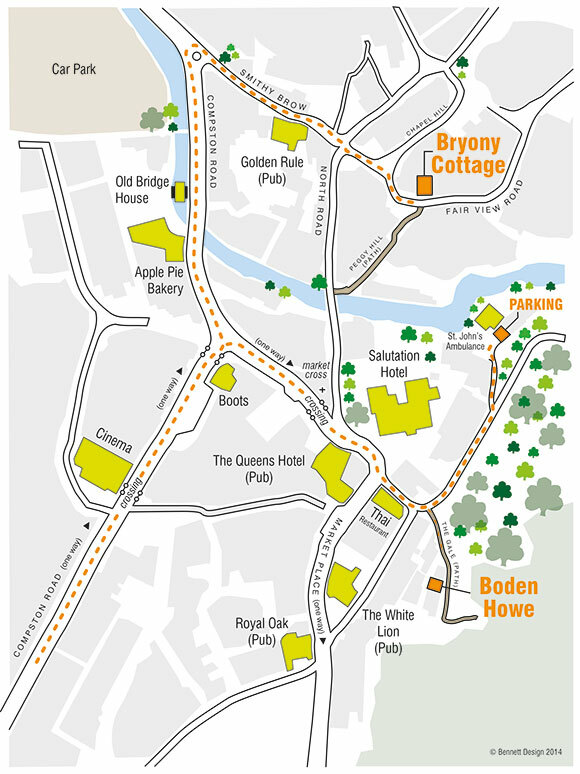 For Boden Howe from the south on A591, (please note there is no car access to the house - it is a minute's walk from our private car park off Stock Ghyll Lane), follow the one-way system into the town centre. As you approach the top of Compston Road, get in the right hand lane and at the traffic lights at the top turn right. Pass through a set of pedestrian traffic lights (parallel with Rohan) and after 50 mtrs take a narrow left opening just past The Salutation Hotel. Bear left on to Stock Ghyll Lane (the postcode LA22 0QY will direct you to this point but do not proceed more than 50 yds after the blind left bend. At the 50 mtr point take a narrow left turn and the parking is ahead of you in front of a pair of white garage doors. To locate the house retrace your steps to the blind corner mentioned above and, on your left, there is a steepish pedestrian path with a yellow grit bin as you approach. Proceed up the path for 10 mtrs and enter the private terrace of houses through a black iron gate - Boden Howe is the second house. For Boden Howe from the north on A591, (please note there is no car access to the house - it is a minute's walk from our private car park in Stock Ghyll Lane), proceed into the town centre and pass through a set of pedestrian traffic lights (parallel with Rohan) then follow the directions above.